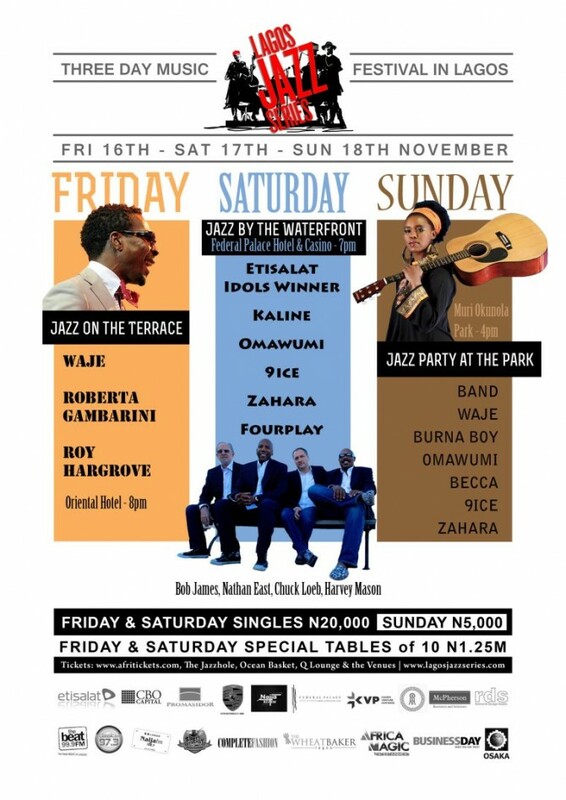 Lagos Jazz Series, the foremost music festival event in Nigeria has released the final lineup of artists appearing at the 2012 LJS Music Festival taking place in Lagos. The event scheduled to hold from November 16 to 18 will feature artists like Roberta Gambarini, Burna Boy and Zahara to mention a few. The third edition of the Lagos Jazz Series is billed to be a musical experience for not only jazz aficionados but also lovers of good music and the good life. Slated for a three day period from the 16th to the 18th of November, 2012, across three stages in Lagos, we will be bringing you different music forms including, but not limited to, jazz, soul and hip hop. The Lagos Jazz Series will feature top-notch music performances at The Oriental Hotel, in the beautiful Muri Okunola Park, and in the serene gardens of the Federal Palace Hotel & Casino. The Oriental Hotel and Federal Palace Hotel & Casino will feature exclusive performances targeted at our high clientele guests and corporate bodies. Muri Okunola Park will feature more populist performances and bring in larger audiences, giving Lagos a broadened cultural scene while also bringing some exciting music to the general populace. Ticketing for this festival is provided through the following outlets: For Oriental Hotel and Federal Palace Palace Hotel & Casino, tickets can be purchased at the concert venues; Jazz Hole, Awolowo Road; Q Lounge 30 Adetokunbo Ademola Str. ; Ocean Basket, Tiamiyu Savage Victoria Island and online via www.afritickets.com. Nigerian Idol contestant Season 2 Steve Onochie, Kaline, 9ice, Zahara and Fourplay featuring Bob James.